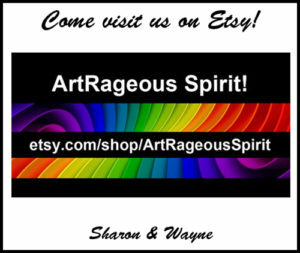 The “Mouse in the House” Trilogy | Simply Art-Rageous! At approximately 11:20 pm on Thursday, June 29, Sealpoint Detectives Kian and Aja were on duty when the suspect (described as small and brown) made a desperate bid for freedom by running out of a lower cabinet. He or she was briefly apprehended and thrown into the air (this is a maneuver that these detectives train for rigorously), but managed to escape to an unknown location under the refrigerator. Off-duty detectives in the area were alerted to the development and quickly provided backup. A sweep of the refrigerator (with a yardstick) produced mouse-sized dust bunnies (which were immediately pounced upon) and numerous fake mice. 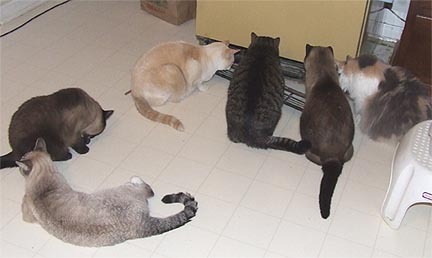 With no activity or sound coming from under the refrigerator, the detectives engaged in “swat team” practice, using the fake mice to further hone their swatting, pouncing and throwing skills. It is not known at this time if the suspect was injured in the initial encounter. 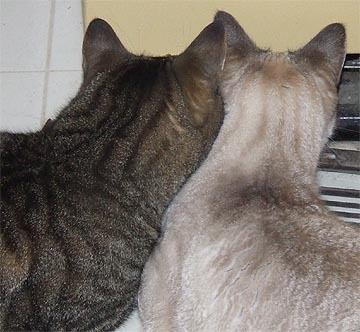 It is also not known if he or she will be able to survive under the refrigerator, given the amount of dust and animal hair (that should have been vacuumed out weeks and weeks ago). It is hoped (by some) that the suspect–who has committed no crime other than being in the wrong place at the wrong time–can be captured unharmed and released outside. Others, however, apparently intend to enforce the death penalty if the opportunity to do so becomes available. Regular patrols continue in the vicinity of the refrigerator and kitchen cabinets, and it appears that no one will get much sleep tonight, including this reporter. SIEGE: n. The surrounding and blockading of a city, town, or fortress (or refrigerator) by an army attempting to capture it (or the mouse that is under it). 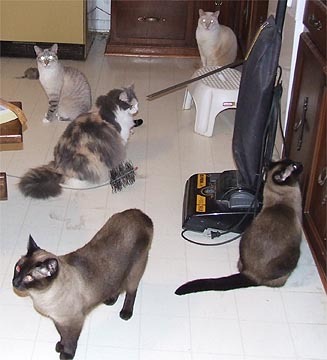 All available swat team members reported for duty on the evening of July 1, 2006, when intelligence indicated that a mouse that had escaped from the kitchen cabinets to a location under the refrigerator on the night of June 29th was still alive and in hiding under the appliance. Highly sensitive and synchronized tracking devices monitored the activities of the suspect throughout the evening. If the suspect cannot be captured unharmed and released, perhaps this effort will later be seen as a last meal before execution…. Or as a last meal before execution and becoming a meal…. Within minutes of the food and water being delivered (via yard stick), the suspect briefly revealed himself/herself and eagerly drank and then ate, as (unclearly) shown in this picture. Surveillance will continue through the night and updates will be posted when there are new developments. 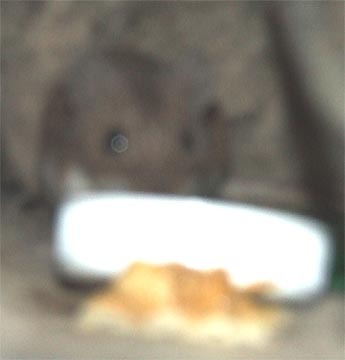 The “Mouse in the House” crisis came to an end–most fittingly–at approximately 11:00 p.m. on July 4, 2006. When “set,” the door is open and the trap is tipped slightly. When the mouse enters the trap, the balance shifts and the door automatically closes. Ingenious. 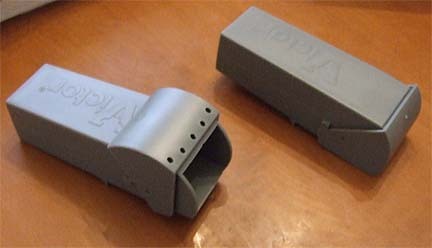 The size of the traps made them a workable alternative for the small space available under the refrigerator and one was put into place at approximately 10:00 a.m. on July 3rd. The suspect had typically become active around 8:30 p.m. each evening, but the detectives showed little interest in the refrigerator on the evening of July 3rd. Was this a sign that the suspect had expired, or was it a sign that he or she had escaped? This question was answered later that evening when all six detectives and swat team members were seen patrolling in the basement. Somehow the suspect had managed to escape from its location under the refrigerator, avoid capture, and apparently seek refuge in a large, unfinished basement closet. This complicated matters considerably. Having a mouse loose in a large house is worse than having a mouse under a refrigerator. The number of hiding places had risen exponentially, and the suspect now had access to walls, the attic, etc. Also there was the matter of where to place the traps. 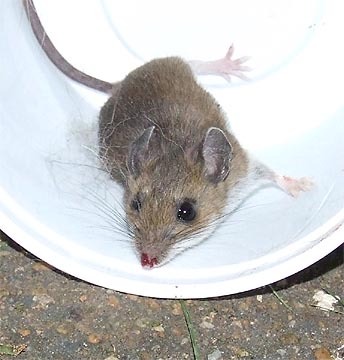 While these “live catch” traps are designed to capture a mouse alive and release it unharmed, the trap must be in an easily accessible location and it must be checked often. If not, it literally becomes a torturously slow death trap for the unfortunate creature that wanders into it. 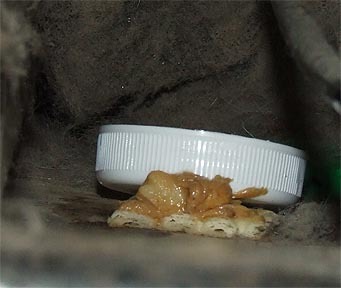 With no decision made regarding where to put the traps and with waning interest on the part of the detectives, it was hoped that the suspect had managed to find its way back outside. 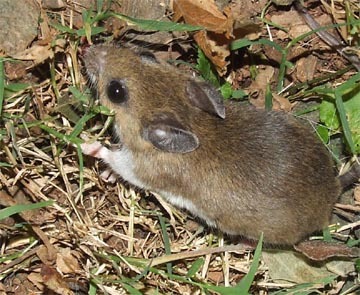 At approximately 11:00 p.m. on Tuesday, July 4, 2006, Detective Riley was in the kitchen tentatively practicing his swat team moves on what was initially assumed to be a toy mouse. This reporter’s first indication that this was NOT a toy was the length of the tail, as most toy mice are quickly rendered tailless. There was no noise. Despite the fact that there were other detectives off-duty and napping nearby, Detective Riley was the only one on the case. This reporter broke the silence by saying several words (which will not be repeated here) and at that point the suspect began to run towards the dining room, with Detective Riley in pursuit. When it reached a corner in the kitchen, Detective Kian provided backup as this reporter searched for a suitable mouse-catching device. An empty margarine container was placed over the suspect, while a sheet of paper was placed underneath. As the container was carefully being lifted, it became apparent that the mouse had suffered some form of injury, as there was a small amount of blood on the baseboard where it had been cornered. The container was taken outside and gently set on the ground. It was hoped that the suspect would immediately flee. It did not. Still silent, it sat motionless in the container. Apparently it was hooked in the nose by Detective Riley’s unclipped claw. While no doubt painful and certainly disfiguring, the injury didn’t appear to be life-threatening, and there were no other obvious wounds. The container and suspect were carried further away from the house to a location under a nearby apple tree. This time the mouse was gently tipped out onto the ground. It remained motionless and with the aid of a flashlight, this reporter had another opportunity to evaluate its physical condition. Tail, ears, eyes, feet and body all seemed intact and unharmed. Suddenly, as if waking up from a very, very bad dream, the mouse began moving–slowly at first, and then more quickly. When last seen, it was running towards the woods. It is hoped that this little creature will recover from its injuries and live to tell the tale–OUTSIDE–to its children and grandchildren. As for Detective Riley? He continued to patrol the basement for a while after this drama came to a close, but now he’s relaxing and no doubt congratulating himself on a job well done.